Please note: I was not asked to review or write about this party. I am not affiliated with Athleta or any of its parent or subsidiary companies, and I was not compensated for writing this post. 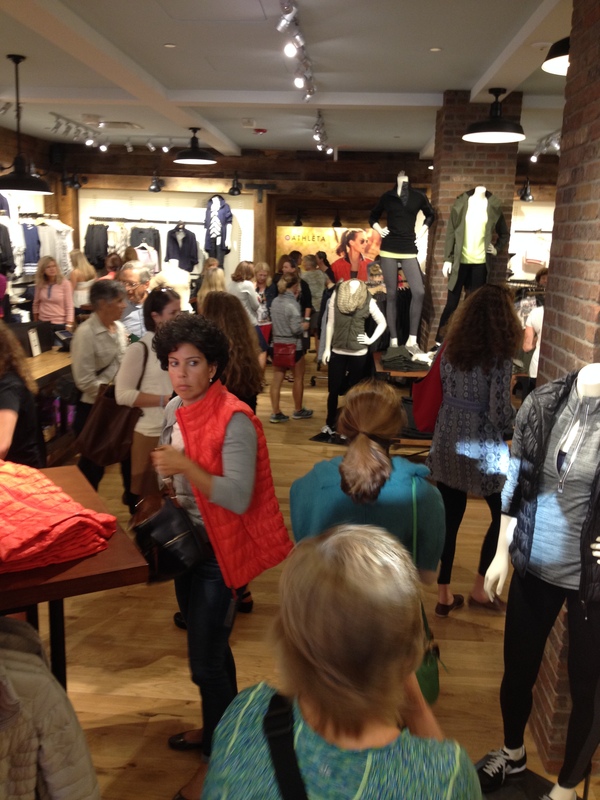 Athleta has finally opened a store near me! I’ve always loved the look of their apparel, but buying clothes online is always a crap shoot. You pay for shipping, and then the item doesn’t fit, and you have to pay additional shipping to send it back. No fun at all. But now, I’ll be able to try on all of the lovely athletic apparel I want without paying for shipping! My college buddy, Chris, is the General Manager of the store, so I got an invitation to attend the Grand Opening party last night (this sounds really cool and exclusive, but they were letting people in without tickets; whomp whomp). Upon entering the store, I was handed a coupon for a free yoga class at a local studio, and this pretty little hair tie/bracelet with the Athleta slogan “Power to the She” on it. I love me some free swag! 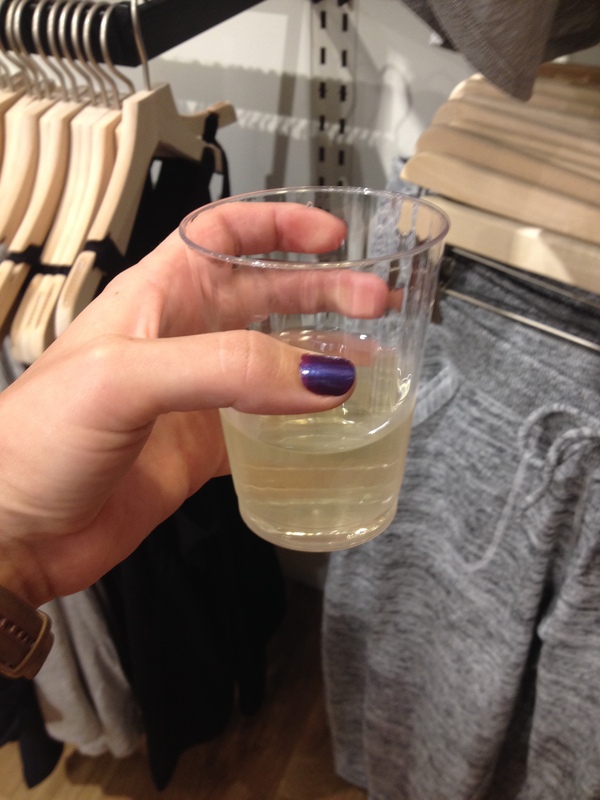 They were also offering complimentary wine, and different juice/smoothie samples. I told one of the (very friendly) employees that I have a running/fitness blog and asked if it was OK to take pictures in the store; she gave the affirmative. Unfortunately, the store was IMMENSELY crowded. I’m not sure they were limiting the number of people allowed inside, and it was difficult to move around. It was also really hot inside, and I started sweating immediately. I loves me some free wine! Another reason I’m so excited about Athleta opening in my town is that they offer all kinds of great in-store activities like fitness classes and group runs FOR FREE! I also found out that they offer free hemming on pants, capris and skirts so that you get the best fit possible. Um, hello? Who does that? Well, Athleta does! And last and certainly not least, they offer a Fitness Professional Discount, so all you certified run coaches, personal trainers, and group fitness instructors can get 30% off full-priced merchandise in store! Woo! Do you shop at Athleta? Have you ever gone to a “Grand Opening” party at a local store? Those plies look delightful for both yoga and snuggling with a book and ice cream. Yes. I love Cabela’s! And I totally would have tried the ostrich meat. So strange and interesting! My kids still joke every now and then that what I am wearing is no longer indicative of whether or not I am going for a run soon … 🙂 Yeah, athletic clothes all weekend unless I have to be a ‘mature adult’ at an event or something … 🙂 I have heard good things about Athleta, enjoy! I’ve never actually worn any of their clothing, but I’m cautiously optimistic. Some of that stuff was so soft and lightweight! Ooh that sounds like a great store! 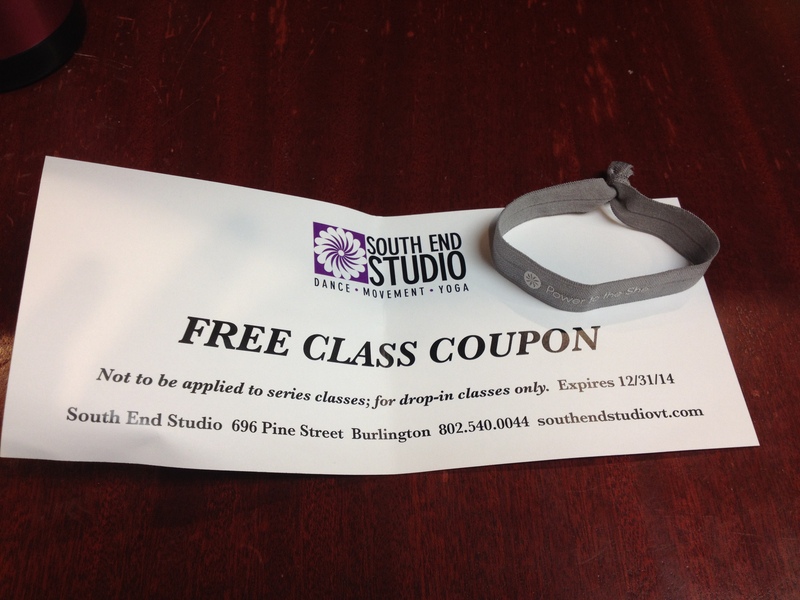 I especially love that they do free hemming, and classes and group runs – awesome! I’ve never seen one of their stores in person, but I’ve browsed online and was instantly turned off by the steep prices. I’m sure it’s good quality though! And free wine? Yes please. Too bad it was so crowded and hot! The prices are definitely a bit steep, but I’m willing to buy one or two pieces to see how they stack up quality, fit, and comfort-wise to what I’m currently buying. If they’re worth the investment, I’ll just buy things here and there as I can afford to. I often want to quit my job (for many reasons) one of which is so that I can find another job (or just stay home all day) and wear nothing but my running/workout clothes! God if I could work from home, I would never wear anything considered “real” clothing again! working from home would be living the dream!